Look, up in the sky--Tourists! One of the exciting things about living this close to the London Avenue Canal north breach is the steady line of tourists. 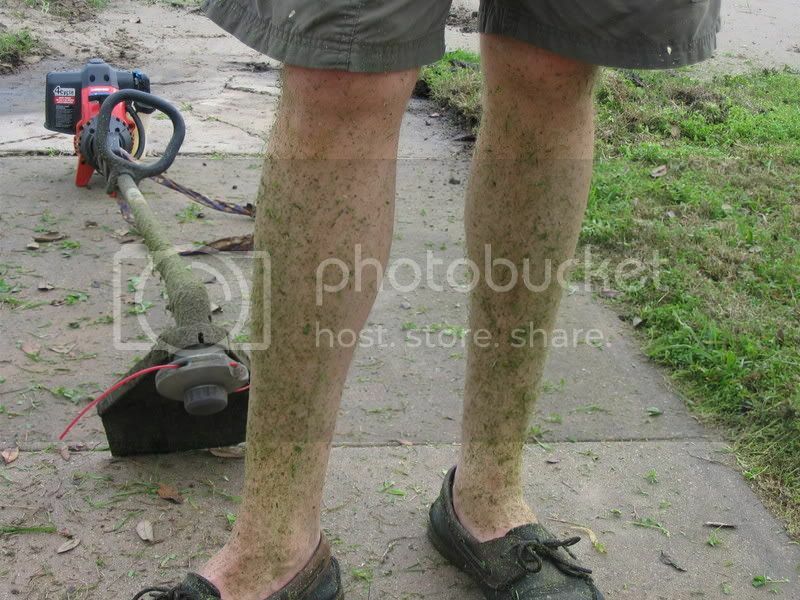 A lot of folks who come to New Orleans nowadays take a guided tour of the flood-ravaged areas. They come in vans and full-sized tour buses, and their path often takes them past our government-issue Emergency Living Unit. I don’t sit outside all day counting, so I don’t know how many buses come by or how often. But on weekends I always manage to notice one or two passing by. Today was especially exciting. 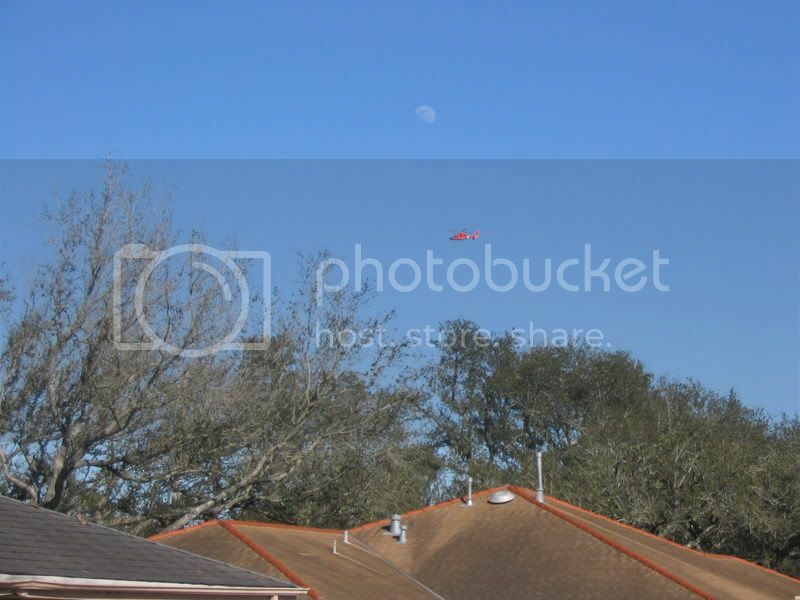 Just a little while ago I heard the thunder of a hovering helicopter. It seemed to stay for quite a while so I went out to look. Actually, there were two of them! 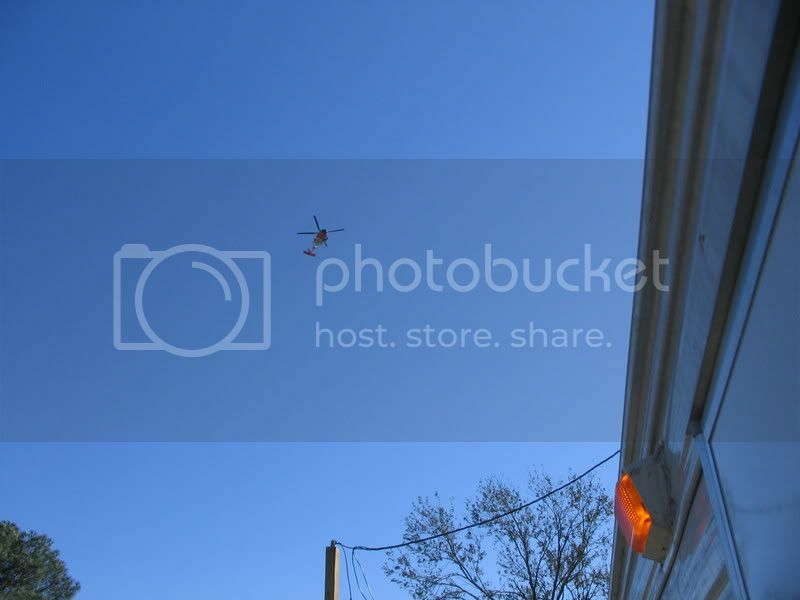 One was a Coast Guard rescue chopper. The other was red, too, but did not have any markings that I could make out. Obviously there are some VIPs in town who needed to see the London Avenue Canal and the progress of work on the Interim Closure Structure at Lake Pontchartrain. They flew up and down the length of the outfall canal more than once and hovered long enough for me to fetch the camera and take some pics. Such fun it is to live here! The other night, President Bush made his State of the Union address to a joint session of congress. The Constitution requires the president to give this annual report to congress. Although it does not specify that it must be in the form of a speech, since the advent of mass communications, presidents have been taking advantage of the occasion to look and act like leaders. The Current Occupant is no exception. But before I offer my comments on the president’s recent speech, let me first remind everyone of what the president said in the past. President Bush gave a nationally televised speech from New Orleans back on September 15, 2005. Not that long ago when you think about it. “In the life of this nation, we have often been reminded that nature is an awesome force, and that all life is fragile. We're the heirs of men and women who lived through those first terrible winters at Jamestown and Plymouth, who rebuilt Chicago after a great fire, and San Francisco after a great earthquake, who reclaimed the prairie from the Dust Bowl of the 1930s. Every time, the people of this land have come back from fire, flood, and storm to build anew -- and to build better than what we had before. Americans have never left our destiny to the whims of nature -- and we will not start now. Those were encouraging, almost visionary words President Bush spoke from Jackson Square. I was still evacuated in Virginia that night, and I daresay that speech was perhaps the most heartening thing I’d heard since the hurricane hit. President Bush on the topic of New Orleans, State of the Union Address, January 23, 2007. I guess I should have known better than to actually take a politician at his word. So looking at the big picture, perhaps it’s better that the president did NOT say anything about New Orleans. It would have been all lies anyway. When the water was rising, we were long gone. Not one to ever consider my property more important than my life, with Hurricane Katrina bearing down on New Orleans, I packed up the family and pets and headed to high ground. Once it was safe, we came back. We came back to be a part of the new rising, the rising of a storm-battered city from its soggy knees. We came back to be among people rising to face new challenges for this old city--challenges that at first consisted of unfeeling weather and lackluster government, challenges that grew to include scarce money and resources, challenges that now include apathy, stubbornness and crime perpetrated on our fellow citizens. But we came back, all the same. We came back because this city exists for a damn good reason. We came back because America depends on this city to support the commerce that travels the largest river in North America and the port that is this nation's portal to the Americas. We came back because just like the ancient oaks that line the avenues, our roots dive deep into the moist earth here, so that it becomes hard to distinguish between what is root and what is soil--or what is solid and what is soul. We took on the difficulties of living here, and did it willingly, eagerly, happily. We took on the indifference of government at all levels--the dysfunction of the city, the stymied response of the state, and the torturous federal government that seems determined to constantly offer one hand of help while slapping us with the other. We took on the apoplexy of family, the discouragement of friends, and the distant whining of neighbors who did not return. We came back because this city is worth saving. We came back because these neighborhoods are worth saving. We came back because it was the right thing to do, and if you don't understand that, I'm sorry, but I can't explain it to you in words. No words, no songs, no picture, no cognitive representation at all can capture the soul of this community. And this community is rising. It rises on the strength of thousands of tired feet, the feet of people marching on City Hall. It rises on the voices of community activists like Bart Everson, who stood tall in front of City Hall and intelligently and emotionally reminded us and our elected leadership that inaction was not an option. Our community rises on the padded shoulders of professional football players who play the game like a team sport, who speak of loyalty and shared responsibilities, and who themselves have risen farther than any team before them. It rises on the determination of homebuilders to never again fall victim to the whims of nature or the shortcomings of manmade protections. When the water was rising, it covered New Orleans with muddy layers of despair and misery. But now it is New Orleans that is rising, above the flood of indifferent nature, above the failings of government, above the brutality of misguided miscreants. New Orleans is rising. I see it in the increasing tempo of construction in my neighborhood. I see it in the newly created Southeast Louisiana Flood Protection Authority East Bank Board, which includes five licensed professional engineers and zero political cronies. I see it in the fierce dedication to city and team on Ashley's tattooed arm. New Orleans is rising, slowly, one stair step at a time, one house at a time, one school at a time, but the uplifting movement is real and palpable. Like raising a family, or raising one's level of education, we take it one day at a time, we celebrate the small victories and learn from our mistakes. We came back, and New Orleans is coming back, too. One of my Vista Park neighbors in this lightly repopulated part of the city is KC. He lives with his wife in a FEMA Travel Trailer, too. Their property is on Pratt Drive, and their backyard borders on the levee and floodwall of the infamous London Avenue Canal a few hundred feet from where the canal breached. Like us, they had their house (what remained of it, anyway) demolished and are making plans to rebuild an elevated, wind-resistant home. Notice the largest category is "Gutted." These are folks who have removed the flood-ravaged contents, floors and walls from their homes in anticipation of repairing them. And yet, more than a year later, their homes stand waiting, open and empty. Work has not even begun on nearly half the homes here. Only 13% of homeowners have found the resources to embark on actual repair and rebuilding of their homes. I am encouraged that more than 1/5 of homeowners have totally demolished their houses, joining with KC and me in the belief that slab-on-grade houses do not belong in this part of the city. Right now KC and his wife's plans to rebuild are complicated by the usual problems faced by those trying to rebuild plus one extra obstacle: there's a road in his backyard. In the desperate days following the collapse of the London Avenue Canal floodwall, construction crews needed access to the damaged parts of the canal. So the Corps of Engineers built a road of rock and sand right through the backyards of about a dozen homes. They did this with emergency expropriation authority granted by the City of New Orleans. Now that the emergency seems to be over, the road continues to be used by on-going construction crews working to complete repairs to the ill-fated floodwall. Unfortunately for KC and everyone else on Pratt Drive, no one knows how much longer that will be. At first it seemed obvious that the Corps and the Orleans Levee Board would need to expand the canal right-of-way to effect necessary repairs and improvements. But since Congress has appropriated money for the Interim Closure Structure and for the design and construction of a permanent pump station at the mouth of the canal, it is not at all clear what will become of this outfall canal. To add insult to injury, you would think these property owners would at least be paid a fair rental rate for the involuntary surrender and use of their personal property, which continues now after more than a year. But they have been paid zero. In addition to his trailer, KC also has a big blue RV parked nearby--you know, one of those motorized bus-like behemoths that cost as much as a small house. But KC did not buy it for recreational use. He calls it his "escape pod." KC plans to keep it in the ready next to his new house and he encourages everyone who plans to remain in the flood plains of New Orleans to get one, too. Not a bad idea, I say. I wonder if it could also be used to escape bureaucratic entanglements and populist politicians. If so, I would go out and get one tomorrow! On Tuesday, America eulogized a former president. Also on Tuesday, New Orleans buried a Duchess. 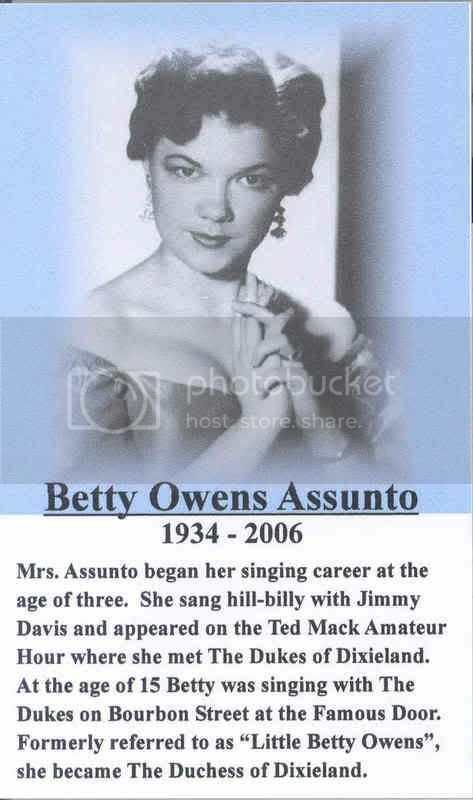 I took my Darling Wife and Precious Daughter to the funeral home to pay our respects to Betty Owens Assunto, the last member of the Dukes of Dixieland, who passed away on December 26, 2006. It was a large and friendly gathering of family, friends and colleagues of the music business. 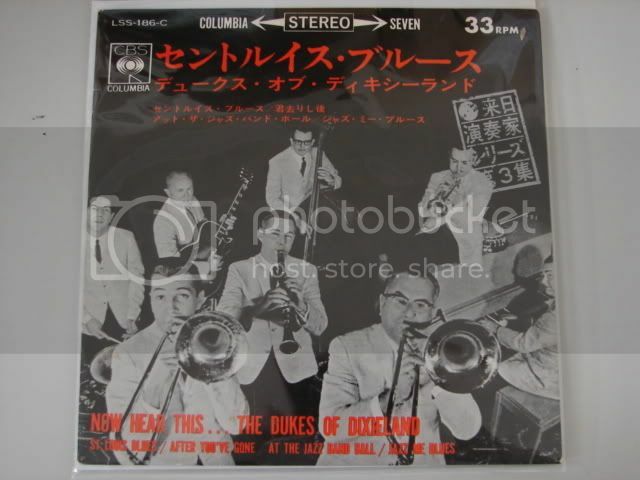 The Dukes were a raucous jazz ensemble that conquered Bourbon Street and then rocketed to national fame in the 1950's. They sold more than a million records and toured almost non-stop well into the 60's. Already a popular singer at age 15, Betty Owens joined the Dukes of Dixieland in 1949 and was quickly nicknamed "Duchess." She later married trombone-player Freddie Assunto at Mater Dolorosa Church on Carrollton Avenue with Pete Fountain as one of the groomsmen. The Dukes were a genuine family band which included brothers Frank and Freddie, their father, Papa Jac, and of course, Betty. Since modern music is dominated by rock and rap, most people under the age of 50 don't know much about Jazz and Dixieland other than Louis Armstrong singing "What a Wonderful World." But before Les Paul and Leo Fender electrified the guitar, loud horn players ruled the music world. Before rock'n'roll captured the spirit of restless youth, Jazz released the tormented souls of generations. And before rap was assailed as the bad-boy of music, Dixieland was the music of choice for those looking to party. * The Dukes headlined in Las Vegas for 64 weeks starting in 1956, then went to Chicago for 16 more weeks of popular shows. * By 1959, they had recorded 9 albums with combined worldwide sales of over 1 million. * The Dukes appeared on the Ed Sullivan show 3 times in 1959. * They appeared on national television numerous times during the 50's and 60's, including: Timex Jazz Hour, the Pat Boone Show, Bell Telephone Hour, Jimmy Rogers Show, Kate Smith TV program, The Tonight Show, Mike Douglas, the Jimmy Dean Show, The Edie Adams Show, Steve Allen, and the Dean Martin Show. * They performed at Carnegie Hall to a sellout crowd. * The Dukes had two albums reach the top ten of Billboard’s Pop Albums chart, first in 1958 and again in 1962. * Walt Disney brought the Dukes to Disneyland in 1962 as part of the annual "Dixieland in Disneyland" concerts. The live recording of their show became a popular album, available today on CD. 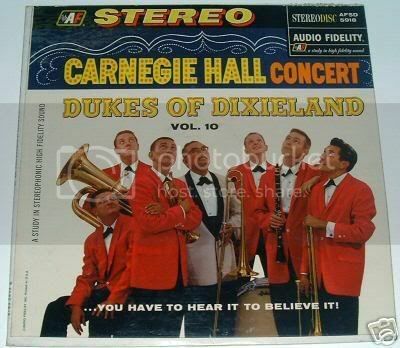 Although the arrival of rock'n'roll probably put a dent in their record sales, the reputation of the Dukes of Dixieland as a wild live act kept them in popular demand in Las Vegas, Los Angeles and New York well into the 1960's. The band didn't slow down until the untimely death of Freddie Assunto in 1966. Brother Frank followed in 1974, and Papa Jac passed away in 1985. After the death of her husband, the Duchess all but left music for good as she raised her three children in New Orleans. But thanks to their many recordings, we can still enjoy the joyful noises of the Dukes of Dixieland and the sweet tones of Betty Assunto on dozens of vinyl records and a few CDs. 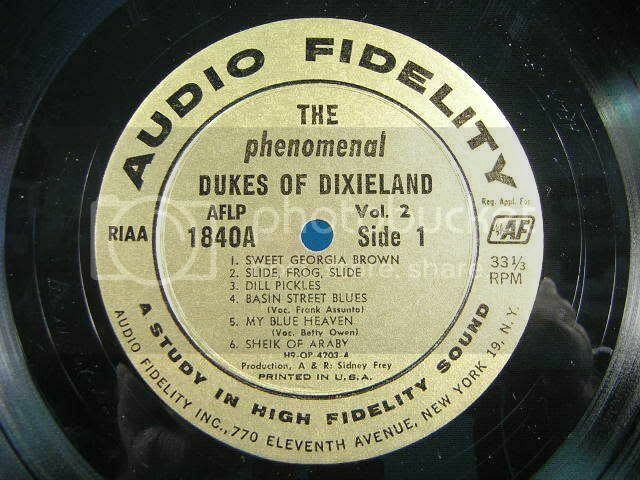 Unfortunately there is an entirely different group of musicians currently performing and recording under the Dukes of Dixieland name. The Assunto family is trying to put a stop to it, but it's been a long legal mess. I encourage anyone shopping for authentic Dukes music to look for the names of the real Dukes--the Assunto family of Freddie, Frank, Papa Jac, and Betty--before making any purchases. Betty left behind two sisters, three children, three grandchildren, and countless friends and fans around the world.